On Friday I got my first look at a seismic survey that will be visualizing the Hayward fault (and the Chabot fault for good measure) this fall. It involves a 15-kilometer line of several hundred seismometers stretching from the San Leandro shoreline to Cull Canyon. 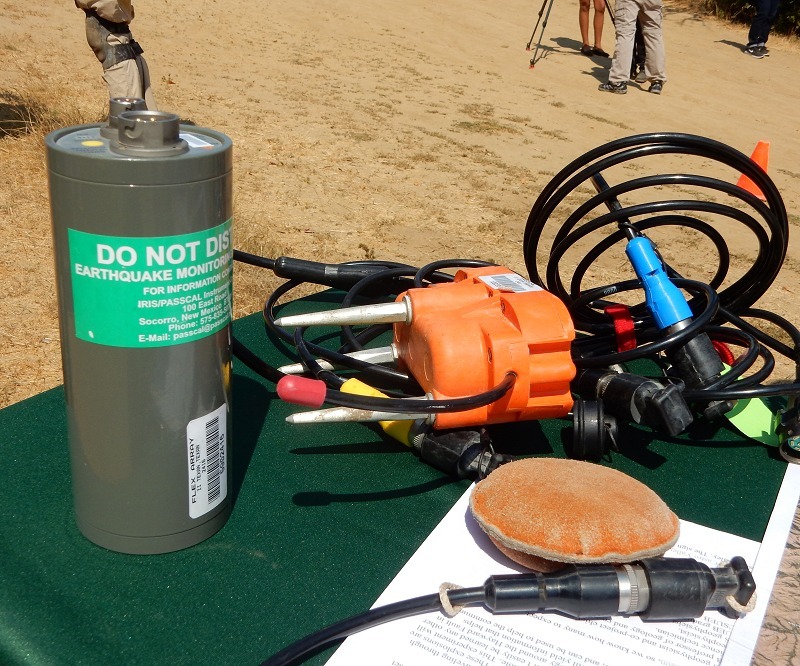 A team of geologists from the US Geological Survey and Cal State East Bay will set off 19 small explosions along the line to serve as energy sources, and the seismometers will record the sound waves as they arrive, after traveling through the various layers of the ground. Here’s the line of charges (as usual, click it for the full-size version); the seismic stations are too numerous to bother showing. The Hayward fault is the red line, the Chabot fault is the blue line, and I’ve added the lidar swath along the fault between the light-blue lines. The purple line is the little-known Miller Creek fault. The occasion on Friday was a photo op for the press. 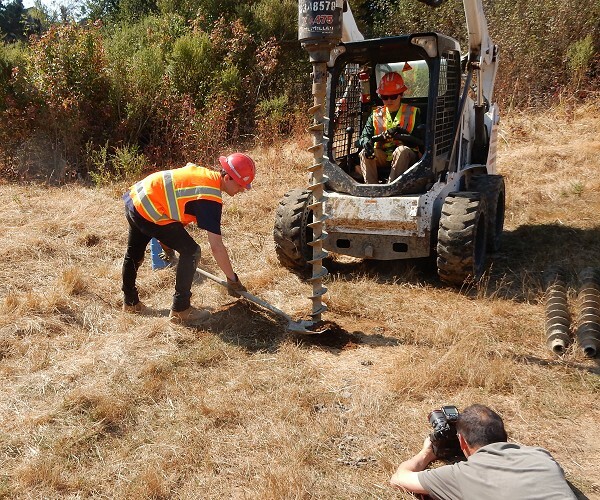 The team drilled a 30-foot hole in which charge number 9 will be placed, and a bunch of reporters took a bunch of footage and asked a bunch of questions. It was a pretty spartan setup. 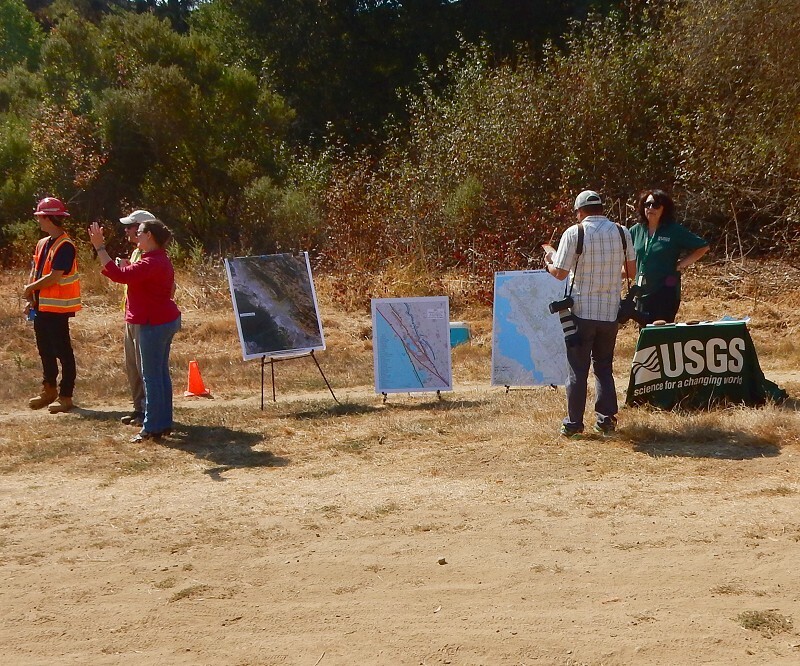 That’s USGS press officers Leslie Gordon waving on the left and Susan Garcia standing on the right. I see them all the time at science meetings. It can be very helpful to have press officers around to answer basic questions in press-friendly ways, follow up with extra pictures and so forth. 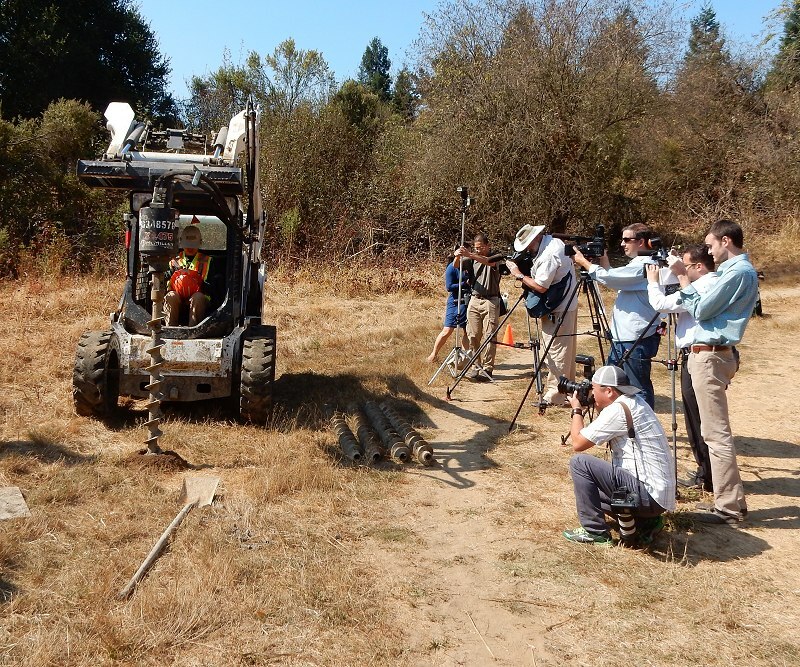 Here’s the press gathering footage as Joanne Chan of the USGS works the Bobcat. Off to the side, the radio and TV people were talking to the chief scientists, Rufus Catchings of the USGS and Luther Strayer of CSUEB. The photogs put their bodies on the line seeking that grab-you image. On the table was one of the seismometers — it’s the orange dealie with the prongs. The can holds the power supply and electronics. You stick it firmly into the ground, hook everything up, and stand very still while the shots are fired. They’ll do the shots late at night to avoid vehicle vibrations. then they’ll put all the instruments away and fill in the holes. Also, thank all the property owners whose permission was required for this important research. As you can imagine, a boatload of planning had to happen before reaching this stage. The USGS’s National Earthquake Hazards Reduction Program is paying for the project. This entry was posted on 12 September 2016 at 8:02 am and is filed under The Hayward fault. You can follow any responses to this entry through the RSS 2.0 feed. You can skip to the end and leave a response. Pinging is currently not allowed.